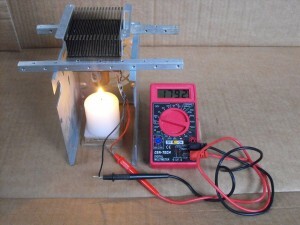 Today I made a compact thermal electric generator ( TEG ) using a thermal electric cooler ( TEC a.k.a Peltier device ) and a Joule Thief. 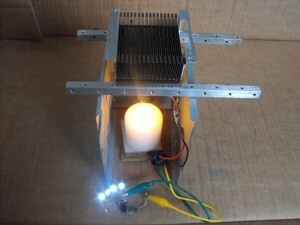 This TEC produces about 1.8VDC when heated on one side and cooled on the other (this setup uses a candle as the heat source and cooling is from ambient air). The advantage of using the Joules Thief circuit in this setup is that it will boost low voltages to higher usable voltages. The open circuit output voltage of the Joule Thief in this circuit was about 31V Peak. It takes about 14VDC to forward bias and light the four LEDs. The down side of this circuit is that there are conversion losses, but still it costs a lot less to buy one TEC then to buy nine of them and put them in series to get to the voltage required. From the time I light the candle it takes ~36 seconds to light the LEDs, and they continue to get brighter from there. The LEDs stay lit for ~2 minutes after I blow the candle out, as the residual heat moves from the bottom heat sink through the TEC to the top heat sink, not shown in the video. Here is a picture of the assembled cooler and heat sinks, I added several pieces of 12AWG solid wire and a 3/4inch copper coupler to direct the heat. I put a 0.5v 1A monolithic silicon solar cell on the front end of the Joule Thief circuit. Added a schottky diode and 2000uf cap on the output. I wanted to see how long it would take the Joule Thief to charge the cap bank. There are two 1000uf/50V caps in parallel to get the total 2000ufs. In full sun it took 3 mins 34 sec. to charge to 21.8 V.
Our Joule Thief Kits are available now. They are on sale for $4.99 each. 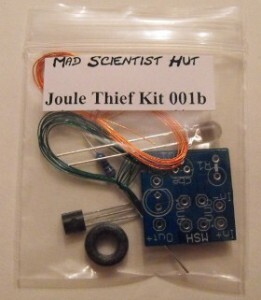 If you are student and you plan on using any of the Joule Thief products for a school project please contact us at sales@madscientisthut.com for a discount. This Joule Thief Kit is available as a thru-hole board kit. This kit allows you to substitute components and includes all parts and a quality PCB. The PCB is double sided with extra copper around each hole on both sides, all traces are redundant top and bottom of the PCB. The PCB design allows for the components to be replaced many times as long as good soldering practices are followed. 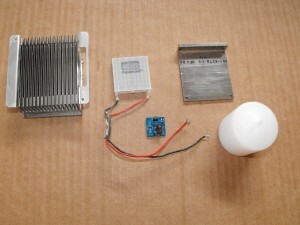 Substituting components will allow the experimenter to try for different voltages or efficiency. BIG educational discounts on kit quantities of 20 or more. Educator kit also includes 1 assembled and tested Joule Thief, please contact us at sales@madscientisthut.com for more information on customized kits. A little info on the Joule Thief for those of you that have not heard about it. In the article “One Volt LED – A Bright Light” written by Z. Kaparnik from Swindon, Wilts, UK published in the November 1999 issue of the magazine “Everyday Practical Electronics” in the section “Ingenuity Unlimited”; described how to make a “Micro-torch circuit” using a very compact high frequency, high efficiency DC-DC converter design. The circuit consisted of a hand wound micro toroid, a 10K resistor and a ZTX450 transistor. The circuit was designed to run a LED that had a forward voltage drop greater than 1.8VDC from a single cell battery (1.5VDC) and could run as low as 750mV, this meant it could run from nearly dead batteries. This circuit has been propagated, experimented with, and changed at numerous sites and discussion boards and most significantly can now run white LEDs that have forward voltages greater than 3V. Someone nicknamed the circuit “Joule Thief” and it has stuck ever since. 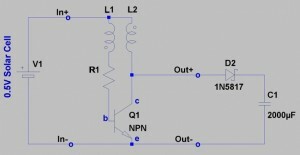 A Joule Thief circuit is a simple three component, low Voltage DC-DC boost converter. The circuit can run on voltages as low as 300-400mV depending on the transistor used and windings on the transformer. The output voltage and current depend on the three components used in the circuit. As a minimum the transistor must have high enough gain and should have a collect-emitter voltage rating that is well above the maximum output peak voltage on the secondary winding ( I like at least a 25% margin ). The resistor is chosen so that it limits the maximum circuit current, by limiting the current to the base of the NPN transistor. 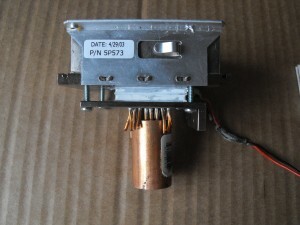 The transformer can be wound 1:1 for simple operation or can be wound with more than two coils ( A third winding may be wound to create high voltages for running EL devices, Nixie tubes, neon bulbs, etc… ). 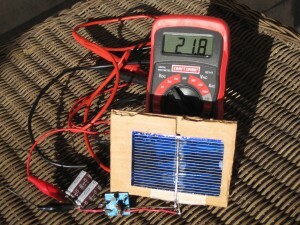 Read the rest of the Joule Thief Blog for circuits, simulations, and experiments.